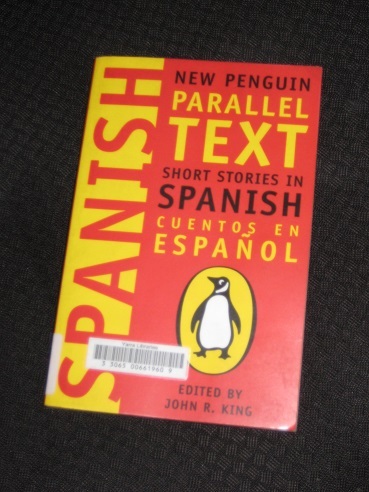 New Penguin Parallel Text Short Stories in Spanish is a new version of an old idea. Edited by John R. King, the book contains ten new stories with the Spanish on the left-hand page and the English mirroring it on the right. The original version, created to cash in on the ‘Boom’, was primarily a Latin-American affair, but the new edition is more balanced, with half of the inclusions coming from Spain and the other five from the Americas. In another way, it’s rather less balanced as only three of the ten stories are by women. The first of these, Soledad Puértolas’ ‘Eva’s Indifference’ (translated by John R. King), kicks off the collection, introducing us to a writer intrigued by the two very different sides to a woman who wants to interview him. Laura Freixas’ ‘Absurd Ending’ (tr. King) also involves a fascinating encounter of the sexes. What begins as a detective story with the visit of a hysterical woman on a dark, rainy night becomes a whole lot more interesting and meta-fictional as the visitor accuses the private eye of being the reason for her miserable existence. Is this a case of mistaken identity, or is there more to her words than the man realises? Pero luego vinieron los extranjeros hablando contra la sabiduría de los ancianos y empujándonos fuera de nuestra tierra. Nos internamos cada vez más adentro de la selva, pero ellos siempre nos alcanzan, a veces tardan años, pero finalmente llegan de nuevo y entonces nosotros debemos destruir los sembrados, echarnos a la espalda los niños, atar los animales y partir. But then came the white ones speaking against the wisdom of the grandfathers, and pushing us off our land. We move always deeper into the jungle, but always they overtake us; sometimes years pass, but finally they come again, and we must destroy our planted fields, put our children on our back, bind our animals, and depart. ‘Walimai’ is a wonderful exploration of colonisation seen from the native point of view, and the story goes on to describe the man’s closer encounters with the intruders and his attempt to free a woman in captivity. It provides insights into a way of life very different to our own and has definitely piqued my interest in Allende’s other work. Among the male writers introduced here, there were several I’ve encountered before. Antonio Muñoz Molina was, of course, the reason the collection came to my attention in the first place, and ‘The Possessed’ (tr. King) is an excellent piece looking at how a pedantic office drone’s routine is upset by his sudden attraction to a schoolgirl in a café. By contrast, the female protagonist in Gabriel García Márquez’s contribution, ‘María dos Prazeres’ (tr. Edith Grossman), is at the other end of the age scale. In this one, an elderly former prostitute prepares for her imminent death, arranging her final resting place in Barcelona, far from her Brazilian home. The impetus for her preparations is a dream she has, but by the end of the story, we’re left wondering whether her interpretation of the revelation may have been rather misguided. – Te prohibo que toques mis clichés, sobrino. Son el escudo de mis prejuicios. Y los prejuicios, como la palabra lo indica, son necesarios para tener juicios. Bien juicio, Archibald, bien juicio. Mis convicciones son definidas, arraigadas e inconmovibles. Nadie me las va a cambiar a estas alturas. However, when her nephew arranges the arrival of a new Mexican housekeeper, she’s forced to revise her opinions (and her tactics) when Josefina fails to live down to her expectations. I tried not to look too much at King’s excellent introduction (including brief analyses of the stories), so I didn’t notice until the end that the stories were actually placed in order of linguistic difficulty. In the case of the penultimate piece, Julio Cortázar’s ‘Second Time Around’ (tr. Griffin), this difficulty was largely due to the first couple of pages, which contained copious amounts of Argentine slang and references to locations in Buenos Aires. Set in the 1970s, this one has a group of people waiting for an interview in a dingy public building, and anyone with more than a passing knowledge of the country’s history will sense that there’s far more to the harmless procedure than meets the eye. The last story in the collection, however, was the only one where I really had to admit defeat in my linguistic struggles. Juan Benet’s ‘Syllabus’ (tr. Southworth) is one of the shorter stories, yet it’s by far the most complex in terms of language, and I spent a fair while lost in the writer’s lengthy sentences before switching my attention to the translation. The story tells of a retired academic’s return for a series of valedictory lectures and how an unwelcome visitor brings the whole thing crashing down around his ears (which is pretty much how I felt after this reality check as to my Spanish-language reading ability…). It does sound like an excellent collection even for those of us not reading in Spanish! Latin America is definitely the realm of short stories. I think you might enjoy reading the works of Horacio Quiroga (Uruguay) and Jorge Luis Borges (Argentina). Borges is challenging even for native speakers, but totally worth it and Quiroga is one of my favourite writers. If you really want to test your skills, you could also give it a try to Julio Cortazar’s novel “Rayuela”… which can be read in at least four different ways and is considered a masterpiece of literary surrealism. Anyway, thank you for reviewing this book. I was looking for more information about the stories it contains as I’m thinking about getting it for someone who is into learning Spanish and this has been very helpful. Saludos! Indiana -I’ve tried Borges’ work before, and ‘Hopscotch’, too, but there’s no way I’d be giving that a go in Spanish!